When lowering the lid of a toilet bowl, it may fall suddenly and may be surprised at a too much loud sound. In the latest Japan, in case the lid of a toilet bowl is closed, it is closed slowly and there is not sound in it. 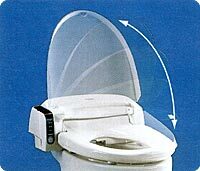 There were many people who do not shut the lid of a toilet bowl, and in order to solve this problem, the new toilet was invented in the United States. When this toilet shuts a lid, water flows. However, this toilet did not sell at all. This "Automatic opening-and-closing toilet bowl lid" has the sensor, a motion of people can be noticed, and a lid can be opened and closed automatically. If people approach, the lid of a toilet bowl will open automatically. If people separate, it will be closed automatically.